We've had some slightly cooler weather here this past week and my thoughts have turned to comfort food! I have some new potatoes that my daughter's boyfriend brought me, and some green beans from my garden waiting to cooked into one of my favorite meals. My husband and I love this old fashioned dish. Both our mothers made this, our grandmothers made this. In fact, most people I know around here cook Green Beans and New Potatoes sometime during the summer. You can use bacon or ham hocks for the flavoring, or even some cooked ham from a bone-in ham. This time I used some ham hocks which give great flavor, but don't yield much meat unless you're lucky enough to find some meaty ones from a butcher. While I normally like green beans steamed or roasted the best, I still have to have this old time favorite several times through the year. It brings back lots of good memories from my childhood as I think of my Mother cooking a large pot of this for supper and my Father coming in at dark after working a long day on the ranch we lived on. Since Mom always had a large garden back then, she also canned, so we had green beans like this all year long. Yes, this is comfort food at it's best! 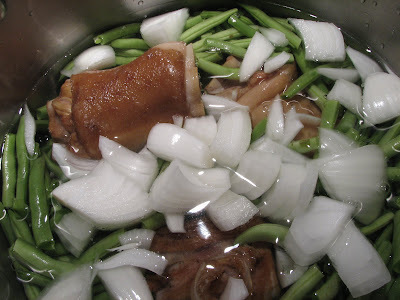 In a soup pot or dutch oven, place the ham hocks and just barely cover with water. Cover and simmer for about 1 hour. Add green beans and onions and cook for another 30 minutes. Next add the potatoes and simmer with pan covered for another 30-45 minutes until beans are tender. Many people cook green beans for a longer period of time, but the beans tend to fall apart more. I prefer that they only cook for about 1 hour to 1 hour and 15 minutes total, but cook them longer if you prefer. Remove ham hock from pan and let cool. Remove any meat from the bones and add to the pot. Add salt and pepper to taste at this time. If you are using bacon, just add it into the pot with the beans in the beginning. I love the fresh green beans with the creamy new potatoes. Normally, I use just the red skinned potatoes for this dish, but I had both red and white new potatoes, so I mixed them. Such a comforting dish for any time of year! If you can or freeze green beans in the summer, then this is a great dish to fix any time of the year. You may also cook this dish in a slow cooker! Place all the ingredients in the crock pot and just let it simmer all day and you won't have to watch the pot. I am submitting this recipe to HoneyB at the Life and Loves of Grumpy's Honeybunch , and Laura at The Spiced Life , for the Family Recipes, Memories of Family, Food and Fun event. What is your favorite way to cook green beans? Thanks for the submission Lynda! This dish looks great. I am definitely trying this. I think we would love the smoky taste of the dish from the ham hocks! Hi, Linda. This is exactly the kind of dish my father would enjoy greatly. I like to sauté the green beens with onions and carrots, then top them with some sour cream and bake shortly in the oven. This looks like comfort food to me. I love the different colors of the potatoes. I can picture this dish on the table in a farmhouse kitchen. I treat green beans very simply, usually steaming or stir frying them to retain color and crunch. This looks summery scrumptious. And all is at farmer's market right now. Thanks for the recipe! GREAT entry! Thanks so much for sending it in! Growing up, there was this one occasion where I got left behind on a family vacation for wisdom teeth removal, and my dad stayed with me. After I had recovered, we spent the week eating potatoes, green beans and corn on the cob while watching old movies (it was summer). It's a great memory. Around here though they are all cooked separately--don't know if that is regional or my family--sans meat (but if my mom had been home it would have been served with meat, haha). Maybe you just gave me MY next Family Recipes entry! HoneyB, yes the ham hocks give a great smokey flavor to the beans! Laura, what a wonderful memory with your dad! Grace, you continue to make me smile; this dish was a staple when I was growing up! 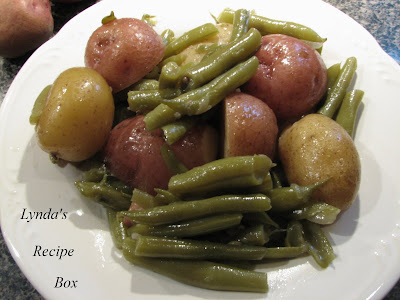 Green Beans with Potatoes - yum! Two of my favorite kids called them 'Best Ever' when I made a similar dish. Where are you in Missouri? If you're close to St. Louis, you might want to join our StL food bloggers group. Oh my goodness I haven't seen this dish since my own grandmother made this. I had completely forgotten all about it. I LOVED this! Thanks for reminding me of this wonderful new harvest meal!! Yum! Old homestyle beans and taters. love 'em. I love food like this - it's comforting and delicious. I mostly steam mine too, but this is one of my favorites too! Cooked down next to nothin' and me, I like the bacon with mine. Looks yummy, I want some NOW!! I love making dishes like this simply because they do bring back wonderful memories! Wow, the hamhocks will definitely give a extra flavor to the greenbeans...looks delicious! Ohh my gosh it has been ages since I have had that, my mom used to make it for us on Sundays! Thanks for the memories!